A Chinese export octagonal soup plate painted in famille rose enamels and gilt with the Arms of Macgregor. A Chinese export small platter painted in sepia and famille rose enamels with the Arms of Grierson. A Chinese export drum form teapot finely painted in famille rose enamels with an unidentified noble coat of Arms. A Chinese export soup plate painted in sepia and famille rose enamels with the Arms of Grierson. A rare Armorial for the American Market : a plate with the Arms of Morgan. Chinese export plate [ainted en grisailles with the crest of Covert . Chinese export armorial plate painted in famille rose enamels with the Arms of Boyd, Earl of Kilmarnoch. 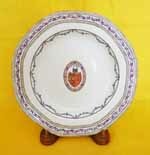 Chinese export armorial blue Fitzhugh dessert plate painted in famille rose enamels with the Arms of Middleton. Chinese export armorial blue Fitzhugh dessert plate painted with the crest of Roberts. Chinese export plate painted in underglaze blue with the Arms of Bruce. Qianlong, ca 1790. Ill. Howard, Chinese Armorial Porcelain, Vol. II, p. 569. A Chinese export baluster form garniture vase painted in blue enamel, rouge de fer and gilt with an ermineshield pseudo armorial and the initials "AC". Qianlong period, circa 1785-95.